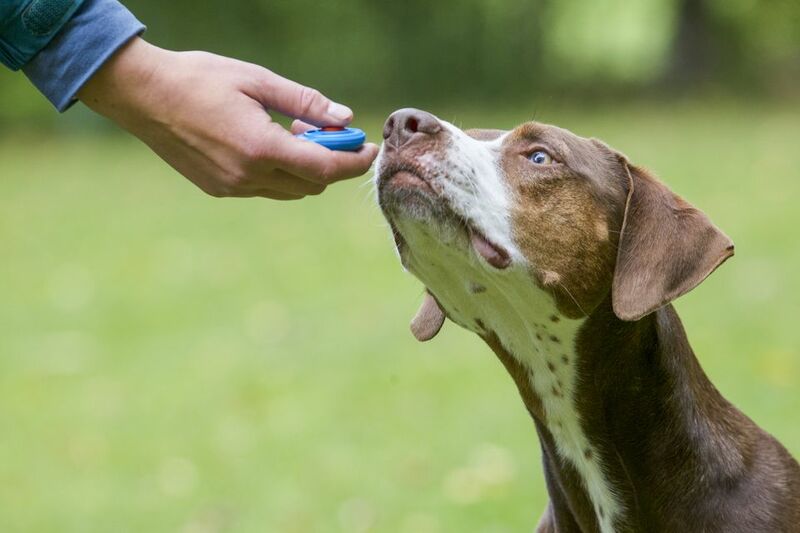 Clicker training is a great way to train your dog. Not only can you capture behaviors with the clicker, but it can be used to shape your dog's behavior as well. Shaping a behavior means training a dog to do something in small stages rather than all at once. This technique is most useful when training complicated commands that may be difficult for your dog to understand at first. You probably don't need to use shaping for simple behaviors, such as training a dog to sit. However, it comes in handy for more complex commands and when teaching your dog tricks. For example, your dog may not understand what you're asking when you say ​"roll over." You can try to lure the dog with treats, but it may still be tough to communicate exactly what you want the dog to do. Shaping allows you to break the trick down into smaller steps to more effectively communicate with your dog. Clicker training is an easy way to shape new behaviors. All you need is a clicker and a handful of treats to get started. Using the "roll over" command as an example will demonstrate how you can use this technique when training a dog. When training, you want your dog's undivided attention so it's best to find a quiet spot in your home, such as a small room. You'll also find it best to eliminate as many distractions outside the room as possible. This means that you may have to wait until there's very little traffic in the house, such as when the kids are gone or in bed. Even footsteps or closing doors in other rooms can be distracting to your dog and hinder your training progress. Start by giving your dog the command to lie down (or the position necessary for whatever command you're teaching). Once in position, give the command "roll over." Hold a treat at the dog's nose, and pull it around so it will have to turn its head to get the treat. Click your clicker and give the dog the treat. Practice this a few times. Once your dog is regularly turning its head, take it a step further: Click and treat only those times when your dog turns its head and leans onto its side a little bit. After some success with that, encourage greater movements. Begin using the treat to lure the dog completely onto its side. When your dog is doing that reliably, click and treat only those times when it makes it onto its side. Next, use a treat to lure your dog to roll, and begin to click and treat only when it begins going over. Continue to slowly build on each behavior, and then choose the best behaviors that get your dog closest to a complete roll until it is rolling all the way over. Once your dog has rolled over completely several times, click and treat only when it rolls all the way over. Your dog should soon be able to roll over on command without needing to pause at the steps in between. It's best that your dog has a firm grip on any supplemental commands needed for the one you're teaching. For instance, if you're training your dog to wave its paw, it should already know how to shake. Go back and work on these foundations before trying to introduce the new trick. If at any time your dog stops showing progress, go back one or two steps and start again from there. Some dogs pick up new tricks rather quickly while others may struggle a bit, so be patient and follow your dog's lead. It's also possible that your dog will begin to lose interest after a while. Younger dogs, in particular, have a short attention span and you might not get to a complete follow through on the command in one session. Call it quits once you notice your dog's attention falter and pick it back up later. In the next training session, the initial stages should go faster so you can build up to where you left off much more quickly. If you find your dog is having a hard time figuring out what you're asking it to do, simply break it down into even smaller parts and shape the behavior you want. In this way, you can train a dog to do virtually anything, from the simplest command to the most complicated trick. Always keep training sessions short and positive. Never scold your dog for not learning fast enough. It's also best to end each session on a good note, so even if your dog isn't doing exactly what you want, finish up with a command it will have no problem with. Offer lots of praise and treats for your dog's willingness to learn and pick up where you left off next time.